At the beginning of 2015, one night I was surfing through Facebook and saw that another friend of mine was engaged. That very moment I messaged Amanda requesting that I make her wedding dress. To my absolute surprise she immediately said yes! Amanda would be my 4th custom wedding dress. Amanda and her mother met me at my parents home for our consultation. We sat at the dining room table to discus the dress plans, go over the design and take measurements. I talked about my design degree, love of art and future plans to have an office space to meet with clients. I was still very very new at this "custom thing". She had one request, that the dress accentuate her grandmother's necklace that she will be wearing on her wedding day. In the dress design I made sure to make the neckline a focal point. I loved the idea of the necklace being something old, while her dress would be something new. Amanda and I have known each other for many years. We were on dance team together in high school. Upon completion of high school, I was even her dance coach for year as I was deciding what I wanted to "be" when I "grew up". 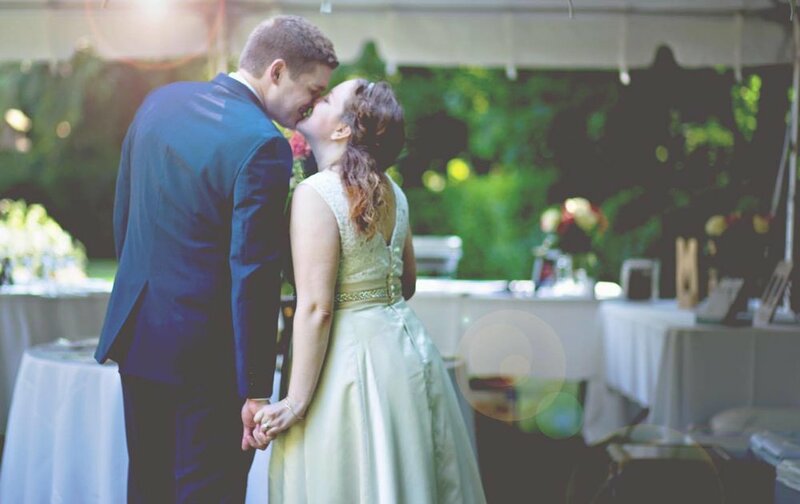 We had a sort of history, but more of teacher/student relationship, until we embarked on the custom adventure of designing the dress of her dreams. If Amanda would have asked me 17 yrs ago to make her wedding dress, I would have laughed because I didn't even know how to sew that well. We held a dress fitting in her mother's living room. This was kind of fun, to bring the dress to her and fit in the comfort of her mother's home. I still didn't have a space to call my own. And I couldn't put the dress making on hold, I had a deadline to meet. I feel in love with this dress. It was different from the typical wedding dress. Simple satin, no train, side seam pockets and a belt (my signature). Amanda and I collaborated on the design and added a left front slit with peekaboo lace underlay. Also created a lace back with hand beaded trim and covered buttons. We held the final fitting in my old bedroom at my parent's home. (so I thought it was the final fitting) When I saw the final dress on my dear friend, I cried. As I have stated in previous blog posts, I didn't realize how sappy I am! Seeing my friends in a design that we collaborated on, pulls at my heart. Amanda had picked up the dress after our fitting and I thought, that was that with the dress. At the end of 2015, I informed Amanda that I finally found a space and it wasn't just a little office. This space is a showroom with huge windows. I asked her if I could put her dress on display in my window for the grand opening in February 2016. She said yes without hesitation. She allowed me to put her unworn wedding dress in my storefront. She has no idea how much that meant to me. I had my two favorite dresses in my storefront for the grand opening. Ironically both friend's are named Amanda. It was destined to happen! Amanda was with me through the ups and downs of finding a space and my small business growing. I decided that I wanted to have a final fitting at the showroom with her mother present as well. It was such a neat moment to have her walk out of the fitting room and onto the platform. Amanda the beautiful bride doesn't realize the confidence she had given me as a bridal designer.